provides, page after page, factual, documentary accounts of the systematic policy introduced by Franco early on in the war to rid the country of the red menace and to install a reign of terror among the few that might still contemplate resistance. … Not that Preston ignores the crimes committed by Republicans. Around 50,000 supporters and suspected sympathisers of the nationalist cause were murdered in Republican-held areas — and most of them have been accounted for. But three times that number were put to death in zones controlled by Franco’s forces. Read the whole, extensive review in IberoSphere here. I think that describing what happened in Spain both during and after Franco took power as a holocaust is accurate; people were killed systematically and for a reason. 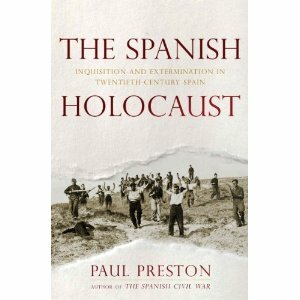 What I have found interesting about the “Spanish Holocaust” and the Holocaust of Germany is that both the leaders reacted the same way when it came to the potential discovery of their activities. Although both preached to their people that their actions were justifiable and right, both destroyed the evidence, as if ashamed of their actions. Franco destroyed the concentration camp Albatera just as Hitler destroyed Auschwitz. The fact that these two leaders tried to hide their activities shows that even they believed their actions to be wrong, despite their constant espousal of ideals; ideals they themselves seemed to not even believe in.